Published by Family Roots Publishing Company. Written in English by Kevan Hansen, the volume was written to help family historians locate their Luxembourg ancestors. It is also available in a library-quality hard-cover edition. Identifies the major online resources for Luxembourg genealogical research. Identifies each canton, its communes, and populated areas with the names in French, German and Luxembourgish. Visually identifies Catholic church parishes within each canton. 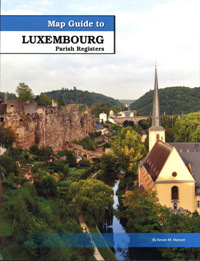 Provides an overview of Luxembourg genealogical records. Identifies neighboring parishes, just in case your ancestor may have gone to an alternate parish. Aids in conduction of area searches, particularly across district and canton borders. Provides visual identification of search areas in which to look for your family. Every canton is mapped to show where each commune lies. The maps in this volume are divided along the administrative boundaries of Luxembourg. Each of the three districts: Diekirch, Grevenmacher, and Luxembourg, are further divided into a total of twelve cantons. Each canton map is then followed by the description of the communes (municipalities) within its boundaries. The descriptions of the communes include the names of the population centers (villages, hamlets, mils, etc.). The names of these localities are shown with their French, German, and Luxembourgish names. To the right of the location name is a number in parentheses which is reflected in the accompanying mini map showing its approximate location within the commune borders. The surviving church records are shown along with the span of years available for them. The beginning and ending dates are representative of the earliest and latest record. In some instances one type of vital record may be more complete than another. Digital images of the records may be searched at FamilySearch.org. They are also available at Archives Nationales de Luxembourg.